A 55-year-old man was arrested Sunday on suspicion of attempted murder after he allegedly attacked two relatives with a knife. Gregory Brunson, a transient, was arrested and booked into Santa Clarita Valley Sheriff's Station Jail after deputies located him in the hills behind a Saugus neighborhood. Deputies were called before 9 p.m. Saturday to a residence on the 28000 block of Oaklar Drive in Saugus after receiving reports of 'a person bleeding.' Upon arrival, deputies found two victims, a man and woman in their late 70's, suffering from stab wounds. The suspect was determined to be a relative of the victim(s), and deputies combed the residence and surrounding areas to locate the suspect, but to no avail. 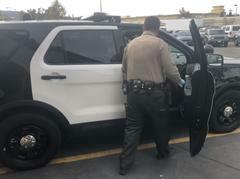 A LASD Aero Bureau unit also assisted in the search. After an extensive search that extended into Sunday, deputies located the suspect around 1 p.m., in hills behind a Bouquet Canyon/ Plum Canyon neighborhood. Gregory Brunson was arrested by deputies on attempt murder charges and taken into custody without incident. The injured victims, who suffered life-threatening injuries in the assault, were taken to a local hospital, and are expected to survive. Gregory Brunson is currently being held on a $2 million bail. Those with any information about the alleged attack are asked to call Santa Clarita Valley Sheriff's Station at (661) 255-1121 ext. 5146. Anonymous tips may be submitted through LA CrimeStoppers at 1-800-222-TIPS (8477) or through the website at www.lacrimestoppers.org.